The constellations best seen in August are Aquila, Corona Australis, Lyra, Pavo, Sagitta, Sagittarius, Scutum and Telescopium. Lyra, Sagitta and Aquila are northern constellations and Scutum, Sagittarius, Corona Australis, Telescopium and Pavo are located in the southern sky. August is the best time of year to observe a number of prominent deep sky objects located in these constellations. The best known ones include the Ring Nebula (Messier 57), the Glowing Eye Nebula (NGC 6751), the Wild Duck Cluster (Messier 11), the Lagoon Nebula (Messier 8), the Omega Nebula (Messier 17), the Trifid Nebula (Messier 20), the Sagittarius Star Cloud (Messier 24) and the Condor Galaxy (NGC 6872). Lyra, the northernmost of the August constellations, is relatively small, occupying an area of 286 square degrees. It is easy to find because its brightest star, Vega (Alpha Lyrae), is the fifth brightest star in the sky and the second brightest star in the northern sky, slightly dimmer only than Arcturus. Vega is a white main sequence star with a visual magnitude of 0.026, located at a distance of only 25.04 light years from Earth. It is 40 times more luminous than the Sun. It is classified as a Delta Scuti variable, which means that it exhibits variations in luminosity as a result of radial and non-radial pulsations of its surface. Lyra is home to several other famous variable stars. These include Beta Lyrae and RR Lyrae. Beta Lyrae, which serves as a prototype of the Beta Lyrae variables, is a close binary system that exhibits changes in brightness because the two components orbit each other and periodically block each other’s light. The eclipsing stars are so close that mass flows from one to the other and they are distorted by gravitational forces into an ellipsoidal shape. RR Lyrae is the prototype of the RR Lyrae variables, evolved giant stars that pulsate over a period of 0.2 to 1 day. These stars are commonly found in globular clusters and are used as standard candles to measure distance. Lyra contains two Messier objects: the famous Ring Nebula (M57) and the globular cluster Messier 56. The Ring Nebula is a planetary nebula with an apparent magnitude 8.8, located south of Vega. It can be seen in a small telescope, but is best observed in larger instruments. It is one of only four planetary nebulae included in Messier’s catalogue. Messier 56 has an apparent magnitude of 8.3 and is found halfway between Sulafat, Gamma Lyrae, which sits opposite to Vega, and the famous double star Albireo, Beta Cygni, located at the base of the Northern Cross in Cygnus. The distinctive shape of the Ring Nebula, the glowing shroud around a dying Sun-like star, makes it a popular celestial object that appears in many astronomy books. 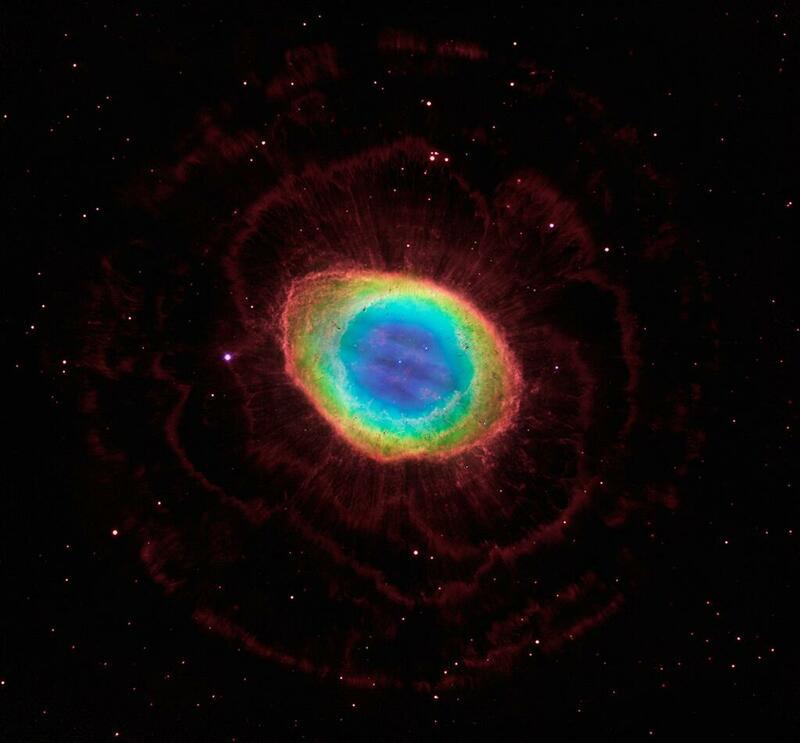 New observations of the Ring Nebula by NASA’s Hubble Space Telescope, however, reveal a new twist on an iconic nebula. The Hubble images offer the best view yet of the nebula, revealing a complex structure. The observations have allowed astronomers to construct the most precise three-dimensional model of the glowing gas shroud, called a planetary nebula. Based on the new observations, the Hubble research team suggests that the ring wraps around a blue football-shaped structure that protrudes out of opposite sides of the ring. The nebula is tilted toward Earth so that astronomers see the ring face-on. Image: NASA, May 23, 2013. Other notable deep sky objects in the constellation include the irregular galaxy NGC 6745, consisting of a trio of galaxies that are in the process of merging, and the globular cluster NGC 6791, one of the oldest clusters in our galaxy. Vega is part of the Summer Triangle, a large asterism that dominates the evening sky in the summer months. The other two stars that form the vertices of the triangle are Deneb and Altair, the brightest stars in the constellations Cygnus and Aquila. Altair, Alpha Aquilae, is the 12th brightest star in the sky, with a visual magnitude of 0.76. Located at a distance of only 16.73 light years from Earth, the white dwarf is one of the nearest stars visible to the naked eye. The two relatively bright stars on either side of Altair are Tarazed, Gamma Aquilae, the second brightest star in Aquila (mag. 2.7), and Alshain, Beta Aquilae, the constellation’s seventh brightest star (mag. 3.71). Tarazed is an orange bright giant and Alshain is a binary star system composed of a yellow subgiant and a faint red dwarf. Aquila contains several notable deep sky objects. The Glowing Eye Nebula (NGC 6751) is a planetary nebula made famous when its image was chosen to commemorate the Hubble’s 10th anniversary. The Phantom Streak Nebula (NGC 6741) and NGC 6781 are two other planetary nebulae in the constellation. Aquila is also home to the open clusters NGC 6709 (mag. 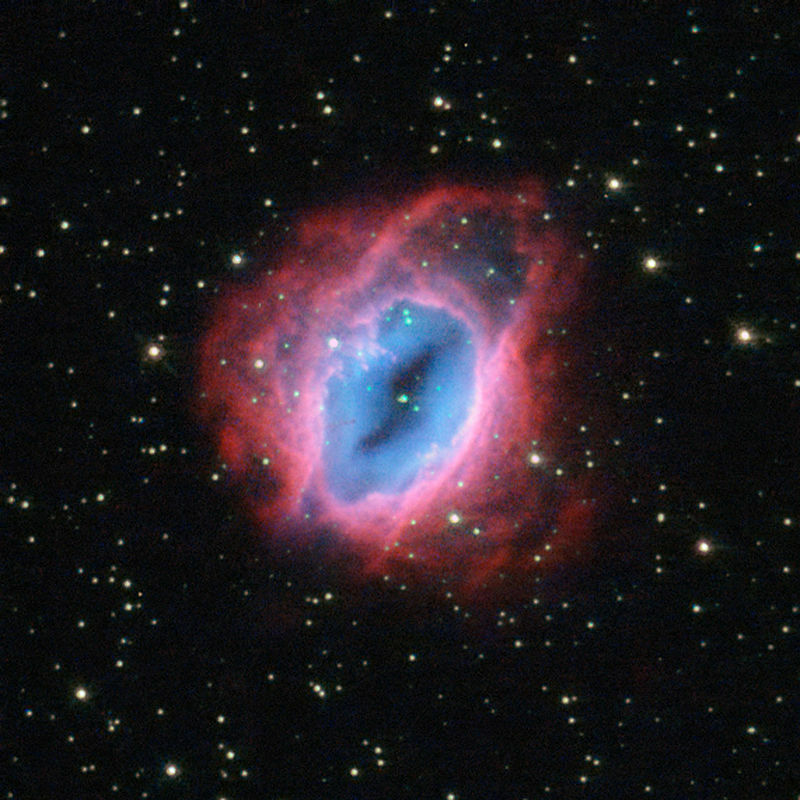 6.7) and NGC 6755 (mag. 7.5), and to the globular cluster NGC 6760 (mag. 9.0). Sagitta is a small and faint constellation, but its distinctive shape of an arrow makes it easy to identify in good conditions. It is the third smallest constellation in the sky, occupying an area of only 80 square degrees, and it does not have any stars brighter than 3rd magnitude. Its brightest star, Gamma Sagittae, marks the arrow’s head. Sagitta is home to two interesting deep sky objects. The loosely concentrated globular cluster Messier 71 has a visual magnitude of 6.1. It was believed to be an open cluster until the 1970s. 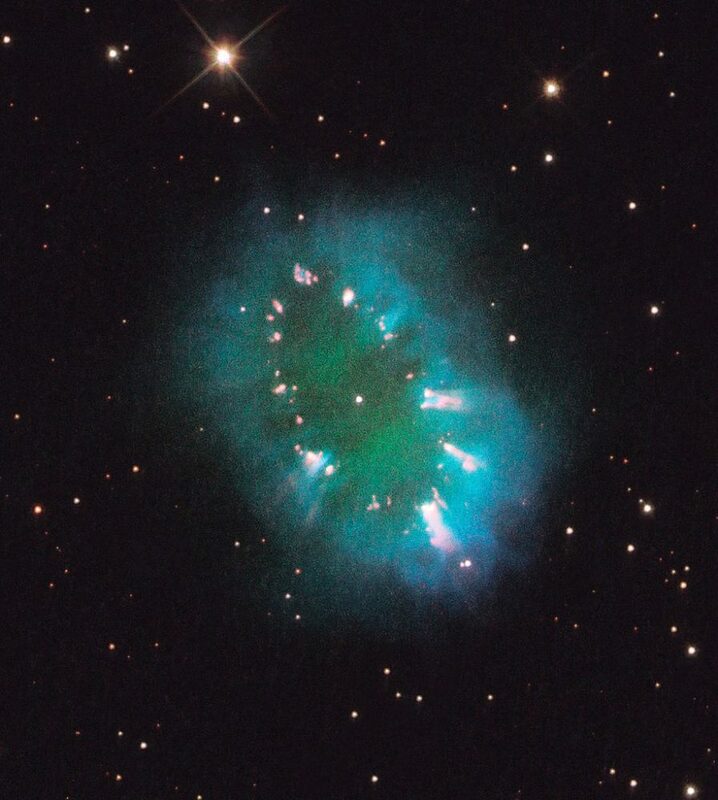 The Necklace Nebula (PN G054.2-03.4) is a planetary nebula spanning 2 light years, located at a distance of 15,000 light years. It was discovered in 2005. Scutum, representing the shield, is also among the smallest constellations. With an area of 109 square degrees, it is the 84th constellation in size. Its stars are quite faint. The brightest one, the orange giant Alpha Scuti, has an apparent magnitude of 3.83. Other stars in the constellation are fainter than magnitude 4.00. Scutum contains the famous variable star Delta Scuti. With a visual magnitude of 4.72, it is the fifth brightest star in the constellation. It is a white giant that serves as a prototype for a class of variable stars known as the Delta Scuti variables or dwarf Cepheids. Like RR Lyrae stars, Delta Scuti stars are pulsating variables, but they are smaller, fainter and have shorter pulsation periods. Scutum is home to two bright open star clusters, the Wild Duck Cluster (Messier 11) and Messier 26. 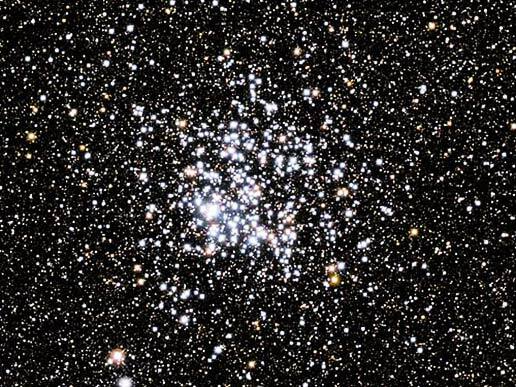 The Wild Duck Cluster has an apparent magnitude of 5.8. It was named for its resemblance to a flying flock of ducks. It is one of the most compact open clusters known, as well as one of the richest and most massive. Messier 26 is considerably fainter at magnitude 8.0. It lies in the same area as M11. Other notable deep sky objects in Scutum include the magnitude 8.69 globular cluster NGC 6712 and the planetary nebula IC 1295. Sagittarius is the 15th largest constellation in the sky, with an area of 867 square degrees, and one of the most prominent southern constellations. It has seven stars brighter than magnitude 3.0. The brightest star in the constellation is the blue giant Kaus Australis (Epsilon Sagittarii), with a visual magnitude of 1.85. With an asterism known as the Teapot dominating much of the constellation, Sagittarius and its many famous deep sky objects are very easy to find. The Teapot is formed by the constellation’s eight brightest stars. 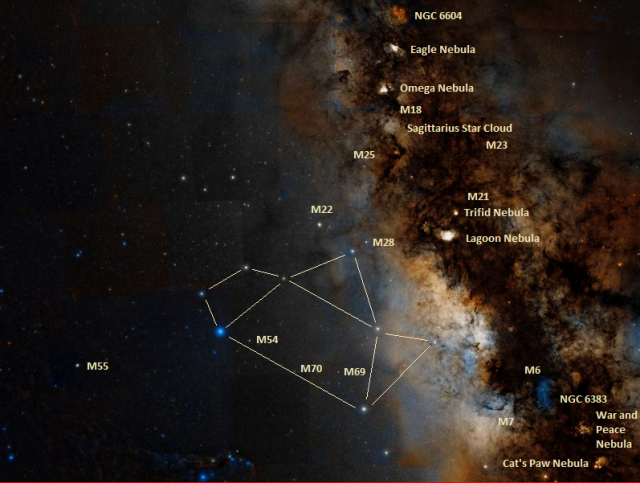 Sagittarius has 15 Messier objects within its borders, more than any other constellation. They are the emission nebulae Messier 8 (Lagoon Nebula) and Messier 17 (Omega Nebula), the emission, reflection and dark nebula Messier 20 (Trifid Nebula), the globular clusters Messier 22, Messier 28, Messier 54 (extragalactic cluster), Messier 55, Messier 69, Messier 70 and Messier 75, the open clusters Messier 18, Messier 21, Messier 23 and Messier 25, and the Sagittarius Star Cloud (Messier 24), a large Milky Way star cloud that consists of the densest concentration of individual stars that can be observed in binoculars. 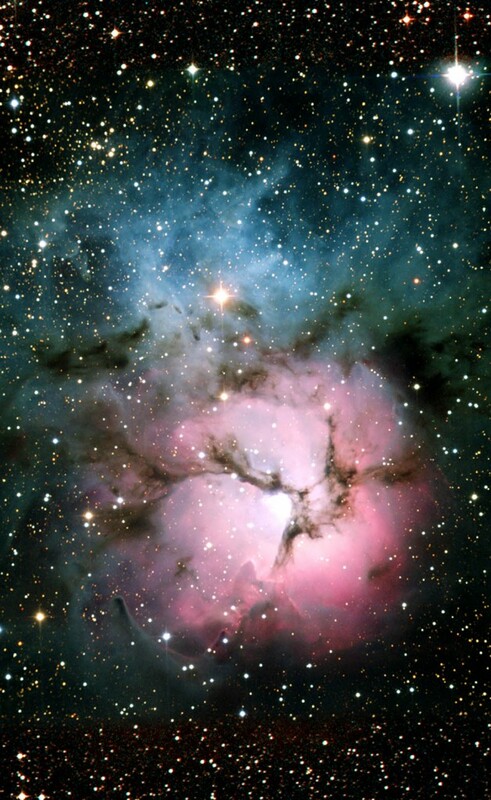 Sagittarius also contains two of the most luminous stars known, the Pistol Star and the Peony Star. The Pistol Star is a blue hypergiant 1.6 million times more luminous than the Sun. It illuminates the Pistol Nebula. The Peony Star (WR 102ka) is a Wolf-Rayet star with an estimated luminosity 3.2 million times that of the Sun. 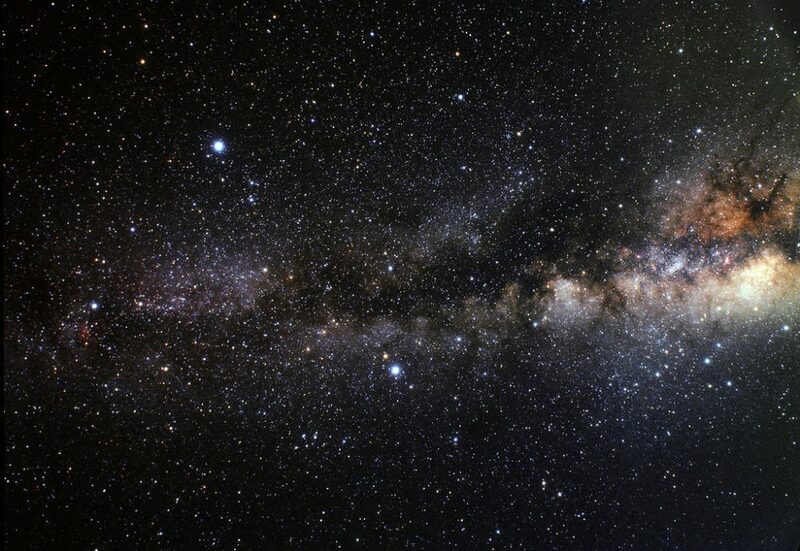 The centre of the Milky Way is located in Sagittarius. The compact radio source Sagittarius A* is the top candidate for the location of the supermassive black hole at the centre of the galaxy. The Galactic Centre lies in one of the brightest patches of the Milky Way, near an area known as Baade’s Window, which has relatively little interstellar dust and offers a view of the central bulge stars. The window covers about a degree of the sky and is centered on the globular cluster NGC 6552. Other prominent deep sky objects in Sagittarius include the planetary nebulae NGC 6537 (Red Spider Nebula), NGC 6565, NGC 6818, NGC 6445, M 1-42 (Eye of Sauron Nebula, ESO 456-67) and NGC 6578, the Arches Cluster, the densest open cluster discovered in our galaxy, the Quintuplet Cluster, another dense open cluster and home to the Pistol Star, the globular clusters NGC 6522 and NGC 6528, and Barnard’s Galaxy, a barred irregular galaxy in the Local Group. Corona Australis, the Southern Crown, is the 80th constellation in size, with an area of 128 square degrees. The constellation’s oval-shaped pattern is easy to identify on a clear night from dark locations, but not from areas with too much light pollution. Located between the brighter Sagittarius and Scorpius, Corona Australis is considerably fainter than its northern counterpart, Corona Borealis, with no stars brighter than magnitude 4.0. The brightest star in the constellation, Beta Coronae Australis, is an orange bright giant with a visual magnitude of 4.1. Corona Australis is home to the Corona Australis Molecular Cloud, one of the nearest star-forming regions to Earth. The cloud lies at a distance of 430 light years. The region is a mix of bright and dark nebulae. The variable stars R and T Coronae Borealis illuminate portions of the cloud and, as a result of their variability, its brightness also changes. The cloud contains a number of reflection nebulae, including NGC 6729 (illuminated by R Coronae Borealis), IC 4812 and NGC 6726/6727. The Coronet Cluster, a small open cluster embedded within the cloud, has an apparent magnitude of 8. It lies in the centre of the constellation. South of Coronae Australis, Telescopium is another faint constellation, with no stars brighter than magnitude 3.0. Telescopium does not have many bright deep sky objects either. It is home to the Telescopium Group, a group of 12 galaxies 120 million light years away. The brightest members are the elliptical galaxy NGC 6868 and spiral or lenticular galaxy NGC 6861. Other notable deep sky objects in Telescopium include NGC 6845, a group of four interacting galaxies, the globular cluster NGC 6584, the magnitude 11.3 elliptical galaxy IC 4889 and the planetary nebula IC 4699. Pavo, the Peacock, is one of the constellations known as the “Southern Birds,” along with Phoenix, Tucana (the Toucan) and Grus (the Crane). Its brightest star, Alpha Pavonis, is also named Peacock. It is a spectroscopic binary star system with a visual magnitude of 1.94. The constellation’s second brightest star, Beta Pavonis, is considerably fainter. It is a white giant with an apparent magnitude of 3.42. Pavo is home to NGC 6752, the third brightest globular cluster in the sky. With a visual magnitude of 5.4, it is only fainter than Omega Centauri in Centaurus and 47 Tucanae in Tucana. Other interesting deep sky objects in the constellation include the spiral galaxy NGC 6744 (mag. 9.14), the interacting galaxies NGC 6872 (Condor Galaxy, one of the largest spiral galaxies known) and IC 4970 (mag. 12.7 and 14.7), and the triplet of colliding galaxies designated as IC 4686, IC 4687 and IC 4689. NGC 6872 and IC 4970 – This composite image of data from three different telescopes shows an ongoing collision between two galaxies, NGC 6872 and IC 4970. Astronomers think that supermassive black holes exist at the center of most galaxies. Not only do the galaxies and black holes seem to co-exist, they are apparently inextricably linked in their evolution. To better understand this symbiotic relationship, scientists have turned to rapidly growing black holes — so-called active galactic nucleus (AGN) — to study how they are affected by their galactic environments. The latest data from Chandra and Spitzer show that IC 4970, the small galaxy at the top of the image, contains an AGN, but one that is heavily cocooned in gas and dust. This means in optical light telescopes, like the VLT, there is little to see. X-rays and infrared light, however, can penetrate this veil of material and reveal the light show that is generated as material heats up before falling onto the black hole (seen as a bright point-like source). Despite this obscuring gas and dust around IC 4970, the Chandra data suggest that there is not enough hot gas in IC 4970 to fuel the growth of the AGN. Where, then, does the food supply for this black hole come from? 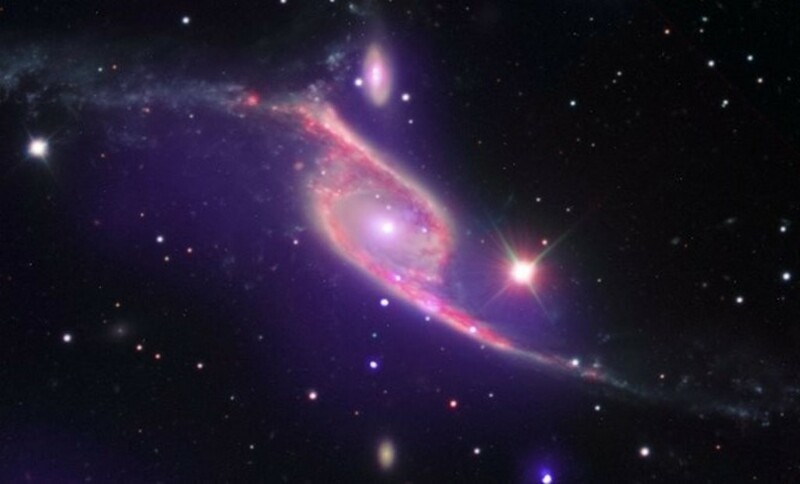 The answer lies with its partner galaxy, NGC 6872. These two galaxies are in the process of undergoing a collision, and the gravitational attraction from IC 4970 has likely pulled over some of NGC 6872’s deep reservoir of cold gas (seen prominently in the Spitzer data), providing a new fuel supply to power the giant black hole. The table below shows the latitudes between which the constellations are visible.